The general concept of a reusable grocery bag-like sack first came into my life when I got one for free (duh) during a job orientation. It was branded and not particularly attractive, but somehow, it soon became integral to my daily bag rotation. I regularly threw gym clothes into it, then put the bag-plus-gym-clothes into my bigger work tote. I used to carry purchases from the market or pharmacy. I used it to carry wine to a friend’s house, then balled it up and stuffed it into my tiny going-out purse. Wear and tear began to take its toll, though, and soon, it literally started bursting at the seems. It was then I knew that I needed a more permanent nylon sack in my life. Enter: the Standard Baggu. I was already familiar with the Baggu brand, since they’re the makers of my favorite bucket bag. But when I came upon their nylon reusable bag, I knew it was meant to be. It may not look it, but this thing is sturdy; Baggu claims it can hold up to 50 pounds. 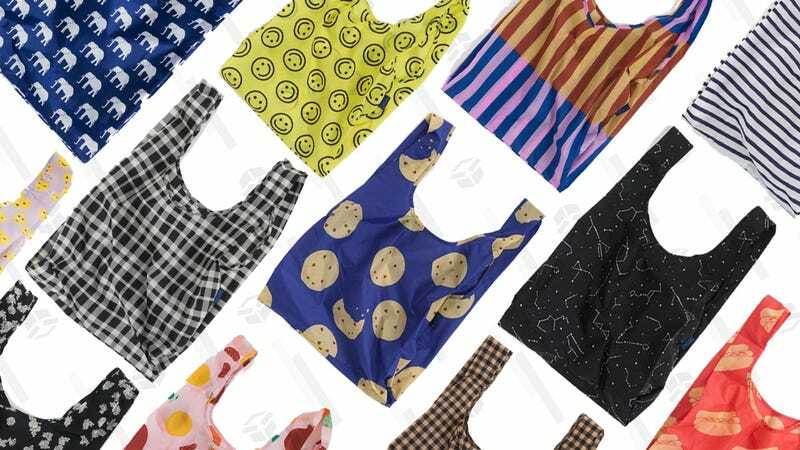 Plus, it’s machine washable and comes folded up into a flat 5-inch-by-5-inch pouch, so it’s easy to stash in your car or another bag in case the need for it arises. I have two Standard Baggus — one in a constellation pattern, and the other featuring the phases of the moon because space is ~cool~ — and I actually enjoy showing both of them off around town. That’s saying a lot for a regular ol’ reusable bag.